GreenWood maintains a network of dedicated and highly qualified artisan mentors—expert practitioners and instructors in a variety of woodworking disciplines. Our world-class artisan mentors conduct training workshops in everything from sawmill installation and lumber grading to chairmaking, bowl turning, pen making and boatbuilding. Before launching any workshop, a field scoping visit and a careful analysis is usually required. GreenWood staff work closely with local NGO affiliates to identify client community(ies) and artisans and to establish a production focus for the proposed training. A budget is drafted and GreenWood often collaborates with local communities or their NGO partners to raise the funds required for the workshop program, as well as to provide essential follow-up support for further training, quality control and product marketing. GreenWood has trained hundreds of artisans over the years, and their responses tell it best. 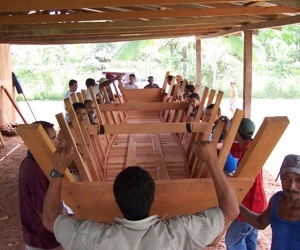 In August 2003 GreenWood artisan mentors and a team of 17 students built two 30-foot, flat-bottomed riverboats (pipantes, in the local parlance) in a three-week workshop in Copén, Honduras. Copén is an isolated forest community located in the buffer zone of the 1.3-million-acre Río Plátano Biosphere Reserve.